In our weekly training rooms, I teach about Hawkeye Volume to help our traders understand the concepts behind volume trading. Today, I will show you how supply and demand zone theory, coupled with volume theory, can yield fantastic results to your bottom line. Today’s trading gave us several great examples of what we call the “Money Bounce” and a “Key Reversal” signal. A Money Bounce is defined as follows: Whenever you have a new supply/demand zone formed, the Hawkeye Zones will color it cyan. The first time price returns to this cyan colored zone, as shown by the first green arrow in Figure 1 below. That is the point where you have the highest probability of a reversal occurring. Figure 1. 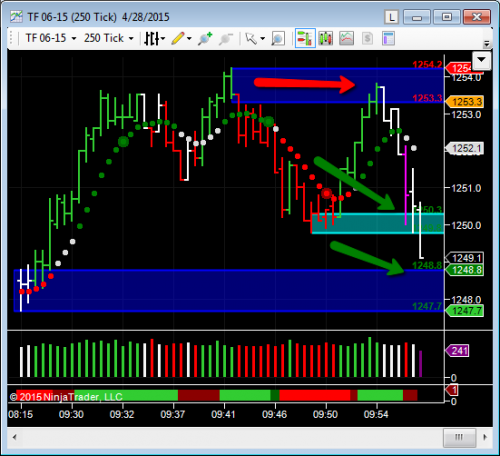 TF Trade 04/28/2015 showing Money Bounce. Once price exits the cyan colored zone (the first bounce), Hawkeye Zones will automatically change the color to blue, signifying that price has hit that zone one time. That way, it is very easy to look at any zone and determine by its color how many times price has visited that zone in the past. Trading the Money Bounce is straight forward – high probability and low risk. We teach entries using multiple timeframes and our 3-step entry method (come to class to learn this valuable method). But on the 250 tick chart shown in Figure 1, the second green arrow points to the entry point of the short based on the Money Bounce. That is the point where our Trend, Volume, and Momentum (Heatmap) all agree and give us a great entry point short. The target for the trade is given by our shorter and longer timeframe Hawkeye Zones, which were 1248.0 and 1238.0 respectively. Figure 2. TF trade 04/28/2015. 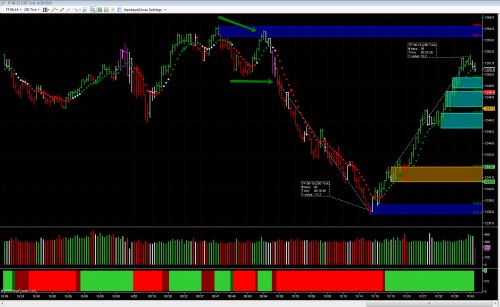 Red arrow shows reversal point, and green arrows show targets. OK, so you can now see how we profit from a Money Bounce. These types of trades occur more often than you think, and we teach these methods in our weekly training room to all our Hawkeye members. Now, let’s look at the follow-on Key Reversal using Hawkeye Zones and Hawkeye Volume to identify another high probability, low risk entry point. Figure 3. 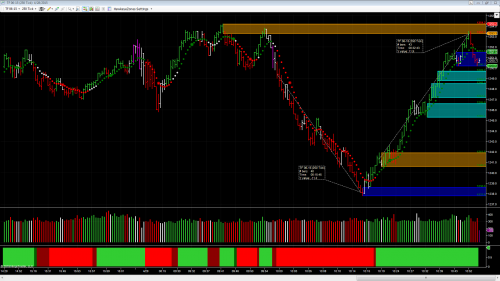 TF trade 04/28/2015 showing short target and volume reversal signal inside demand zone, with partial Hawkeye Pivot low forming, indicating exhaustion and key reversal. Referring to Figure 3 above, notice that after the price hit the 1238 blue demand zone, the price bar closed higher than the open, and Hawkeye Volume painted it green, signifying that buyers have now entered the market and the short move has entered exhaustion. The following price bar is also showing that we have half of a Hawkeye Pivot forming, telling us to expect three to five price bars of reversal price action. Figure 4. 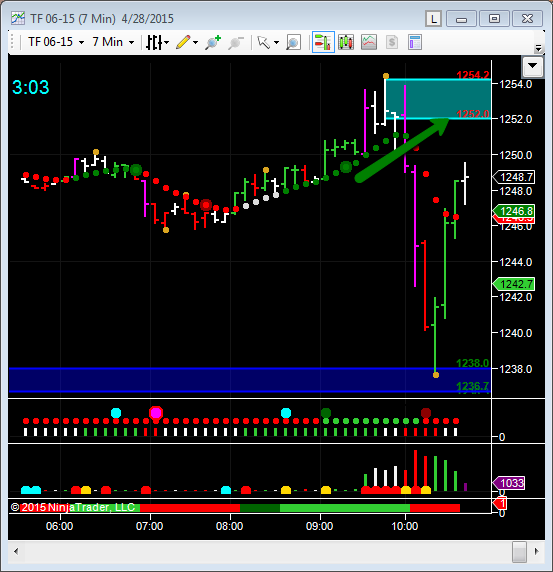 TF trade 04/28/2015 showing Key Reversal, Hawkeye Pivot, and target point at 1252. As expected, we now see from Figure 4 that the pivot did indeed form, and we have three reversal price bars on the chart. The green arrow points to the target based on our Hawkeye Zones (the target is the next zone of opposite type, which in this case is the supply zone at 1252.0). Again, trading the reversal is shown in Figure 5, where the long was entered when the Hawkeye Trend, Volume, and Heatmap all agreed on our 250 tick chart, with targets at 1252.0 and 1253.3 respectively. Figure 5. TF trade 04/28/2015 showing long entry point and target. As shown in Figure 5, the summary trades yielded 11.2 TF points to the short side, and 11.9 TF points to the long side, which equates to $2,310 per contract traded. Not too bad for one hour of work! In summary, learning how to trade using Volume coupled with supply and demand theory can significantly add to your bottom line. If you are a Hawkeye Member, you get all this training for free. If you are are not already a member, CLICK HERE to get our Volume Starter Package, and start coming to our special Thursday training for members only. Otherwise, we demonstrate this and many other methods in our live demonstration room held every Wednesday, and this is open to everyone. Click this link for more information or to join us in class. Next PostNext What Do Apple And The ES Have In Common?